When Frank Woolworth opened his first store in 1879, everything was priced at five cents. In today's nightmare economic climate a Woolworths share now sells for less than that. So I thought I'd better pay a visit while stocks last. Turns out I live in a Woolworths hotspot, with as many as three Woolies stores within a mile and a quarter of my house. I took a shopping list to all three. Ah, now that looks like a proper shop. Bold brick frontage, windows splashed with 3 for 2 offers, and a big blue lottery sign dumped outside on the pavement. Who could resist? Well, most of E3, by the looks of it. Business wasn't brisk yesterday, maybe thanks to the downpour that preceded my arrival, or more likely because most of the other shops along Roman Road were closed. Inside, for a select few, the usual Aladdin's Cave of retail titbits held limited appeal. Cutlery, extension leads, Dylon... all left untouched in favour of a few Woolies staples. One lady's basket brimmed over with value toys and cheap glitzy decorations - nothing gets in the way of a traditional East End Christmas round these parts. But entertainment's where it's at, and the DVD/CD/Wii section was the only area keeping profits afloat. The staff were matched roughly 1-1 by customers, which enabled them to offer helpful personal service as appropriate. Whilst skulking around the rear of the store I spotted a bald man sitting in the corner in a tiny walled-off wooden office, keeping careful watch over the personnel and the takings. It was like stepping back in time to the department stores of my childhood, which I guess this place still is. I came away with a lemon squeezer for £2, because I needed one. And I came away with the feeling of a friendly local store where the staff still look out for one another and go the extra mile to get things right. How very different. The Stratford store is considerably bigger and busier than Bow, part of a more modern mall development, with a full range of Woolworths paraphernalia stacked up within. You want music? There's a restricted range of top albums and cheap back catalogue (the best selection in town until upstart HMV appeared a few years ago). You want books? There's a very limited handful of bestsellers (completely overshadowed by WH Smith nextdoor). You want stuff for children? There's everything from themed pyjamas to neon plastic pencil sharpeners (and where else on the High Street are you going to find those). You want rotten teeth? Never fear, because the pick'n'mix is still going strong (now scooping at 69p per 100 grams). Something for the car, something for the kitchen, even replacement plastic insoles, it's all packed in here just in case you might ever want it. And often you only realise you want something when you spot it on the shelves, which is why I walked out with 50 binliners and a four quid oven glove. Nothing classy, but tasteful enough. 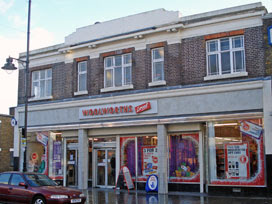 Until the Stratford City development comes along, Woolworths is still top of the shops. Another store, another differently-branded frontage. This one's proper old school, as if central office have forgotten to upgrade the lettering since the 1980s, but inside it felt the most modern store of the three. Neat parallel aisles, a separate checkout area, and a uniformed security guard by the front entrance. Hmm, for how long have Woolworths stores had a uniformed security guard at the entrance? Do bosses think shoppers are going to run off with a pocketful of cola jelly snakes, or maybe whisk away a surreptitious Terry's Chocolate Orange? Late Sunday afternoon it was no trouble keeping an eye on half a dozen customers. Children's clothes were the big draw here, deserving of their own separate department and chosen with cash-strapped local mums in mind. I noted that Woolies' cheapest compilation CD costs a mere £1, and that the store still sells singles but only if they're X Factor related. My thoughts, however, were focused on the Secret Santa gift I needed to buy for work. With a price limit of only £5, where better than Woolworths to hunt down something appropriate and extra cheap? And yes, of course Woolies came up trumps, but I'm now wondering whether I dare wrap and send my special present even under a cloak of anonymity. 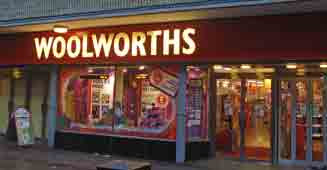 You may sneer but, in each of the High Streets I visited, the local Woolworths is the toppermost retailer in town. That's especially true in Bow and Poplar, impoverished neighbourhood centres overlooked by almost every other major national chain store. If these downmarket marketplaces ever shut up shop, they'll be greatly missed.